When hard drive data is deleted, are these really gone? The answer is no. Data deletion is not the same as data destruction. And when it comes to businesses, data destruction is the better answer. All Green Electronics Recycling provides the technology to absolutely remove data from the system. 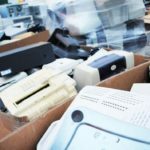 We offer Norwalk E-Waste Disposal. The most important assurance a business gets when it comes to data destruction is that the process will be secure. Sensitive information is in every technology employed by the company—computers most especially, photocopiers, fax machines, printers and phones. We employ transparency in our electronic waste disposal approaches. The process clearly follows a chain of custody for every IT asset. This way, clients will have peace of mind as to how data are secured through a certified data security reporting. It also has a military-grade data destruction, which simply means bulletproof data destruction. There are two kinds of data destruction—digital wiping and physical destruction. Digital wiping means no iota of information will be left in the system once the Norwalk E-Waste Disposal is done with its job. Physical destruction simply means the appropriate disposal of the physical system or equipment. The company employs experts that are skilled and efficient in this highly sensitive service.